In October 2015 my wife died of ovarian cancer, after a three year battle to try to overcome her illness. Her name was Beata and she was just 41 years old – a beautiful young woman with a beautiful spirit, full of love, kindness and excitement about the wonders of life. We had been married for just six months when she died and were deeply in love. We were soul mates, best friends and a great team. Like so many before her, her life and mine had been taken over by her cancer from the moment she was diagnosed. Our lives revolved completely around doctor and hospital appointments, research into treatments and diets, and putting into practice healthy lifestyle changes that we hoped would make a difference. She was forced to accept a punishing treatment schedule with systemically damaging side-effects and virtually no prospect of a cure, just to be able secure what little extra time she could. She twice had major surgery, underwent twelve gruelling chemotherapy sessions that caused her a great deal of physical and mental suffering, participated in demanding clinical trials of experimental drugs, had ports and tubes implanted in her to make it easier to administer drugs and blood tests, and had numerous emergency visits to A&E to deal with life-threatening symptoms from her treatments. From the outset Beata was given a very poor prognosis, as there are few treatment options available for ovarian cancer and none that have long-term success once the disease has spread. But she was determined not to accept defeat; if the medical profession had no cure she would do all she could to try to find one herself. So, she put every ounce of her energy into researching alternative and experimental treatments that might help, making huge sacrifices and changes to her life to give herself more chance of a future. 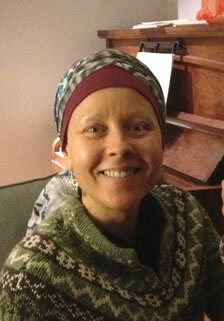 Beata desperately wanted to live and was quite literally dying for a cure. Sadly, she wasn’t successful in her quest and became one more number to add to the 160,000+ people who die from cancer in the UK each year. Even this number is understated as the cause of death is sometimes recorded differently if someone dies from the side effects of cancer treatments. But how can we as Society be so accepting of this many deaths? This is a huge number. Just to put it into perspective, this is one death every three minutes. It is half as many as the total number of Britains who died fighting throughout the whole of the Second World War. And it’s a problem that’s getting worse – around half of us are now expected to get cancer at some point in our lives compared with just a quarter in the 1970’s. Somehow Society has become far too accepting of the growing problem of cancer and the regularity with which it strikes seems to have made us numb to its impact – we reluctantly accept it as an inevitable part of modern life, instead of holding to account those who hold themselves out as responsible for eradicating this disease. We need to pick ourselves up from our grief and start asking challenging questions. Why has a cure not been found after decades of investing billions of pounds in drug research? Why is it when the newspapers hail the latest breakthrough in cancer treatment it turns out that it is only expected to extend people’s lives by just a few months? Why is it that the UK’s latest cancer strategy is focused only on gradual extension of survival periods, resulting in treatments that just defer death, rather than cures that allow people to go back to a normal life without needing ongoing treatment? Why are there no official statistics on how many cancer patients have actually been cured of cancer and only statistics on how many people have survived it for just 5 or 10 years instead, even though many of those ‘survivors’ still have cancer and have to live with the suffering it causes? What is behind the many accounts of people who have cured themselves of cancer using non-medical means? How did they do it without the help of billions of pounds of funding available to the drug companies? Why are these cases not investigated further? It’s easy to get the impression that the whole subject of cancer cures is just being avoided – we’re not measuring how many people have been cured, we don’t have plans aimed at developing cures and we fail to follow up information that might help us to find cures. Everyone just wants to talk about treatments and survival periods, not cures. In 1971 US President Richard Nixon signed the US National Cancer Act, signalling the start of the “war on cancer” to search for cures, but not a single new cancer cure has been developed since then. Some people argue that this is because the task of finding cancer cures is more difficult than anyone imagined and public perception seems to be that everyone is doing all they can. I’m not convinced – almost anything can be achieved given the right incentives but the incentives to find cancer cures just aren’t there. The people looking for cancer cures (the pharmaceutical companies) have nothing to gain by developing them, but plenty to lose. 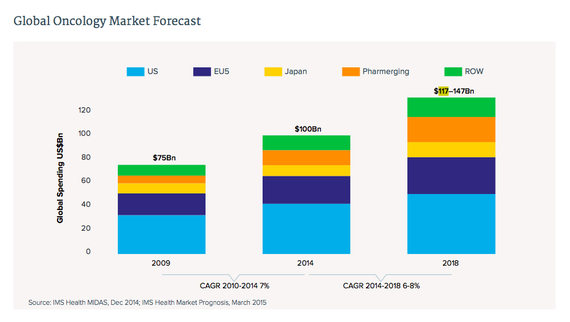 The global market for cancer drugs is huge. In 2014 revenues from cancer drugs passed $100bn (that is $100,000,000,000) up from $75bn just 5 years earlier and with estimates that it could reach $147bn by 2018. But it’s not just the scale of revenues that is staggering, it’s also the scale of profiteering – the pharmaceutical industry makes bigger profit margins than any other industry, with some drug companies making eye-watering profit margins of up to 42%. Treating cancer must be one of the most lucrative business opportunities on the planet. Why would any pharmaceutical company want to destroy a market this valuable by developing cures? Once a cure is found and the drug is out of patent, the price of the drug would then plummet and so would any future profits – typically drug prices drop by 90% when a patent expires, as the price then reflects only the cost of manufacturing it rather than the cost of upfront R&D. New drugs usually have a 20 year patent giving the drug company that invented it exclusivity for this period and therefore the opportunity to name its price while it is the only company supplying it. It typically takes 10-12 years to get a new drug licensed, so this means that drug companies have a monopoly on new drugs for the remaining 8-10 years of the patent period. If cures were to be found, there would be no need for new treatments and no more sky-high prices. But we can’t blame the pharmaceutical companies for wanting to grow markets and maximise profits, as they are just doing what commercial organisations are supposed to do – act in the best interests of their shareholders. The blame lies with us; with Society. We have placed the responsibility for developing cures for our most deadly diseases into the hands of organisations motivated solely by profit not by public health. The prize of saving lives is not enough motivation alone to find cures when the price to pay is a big drop in your share price. This issue has also recently been recognised on a wider level by the Council of Europe, which has produced a draft resolution blaming conflicts of interest for the lack of cost effective and therapeutic new drugs in recent years and recommending market reforms to ensure that public health interests are put first. This whole situation is madness and surely it’s easy to see that. Progress is being thwarted because of the competing needs of those investing in developing cures and those who need them; a tug of war between the shareholders of pharmaceutical companies and cancer patients who depend on the drugs they develop. Shareholders, who invest in pharmaceutical companies, understandably want to make as much profit as possible from their investment and the best way to maximise profits from the ‘cancer market’ is to slowly introduce highly profitable new drugs of marginal therapeutic benefit over a prolonged period of time (to maximise the total revenue that can be generated before lasting cures are developed). Patients on the other hand, who depend on pharmaceutical companies, want the opposite -they want low cost breakthrough drugs with big health benefits to be developed as soon as possible. It’s a battle between health and wealth, trading off lives for profits. And the pharmaceutical companies are the ones in control, with little or no regulation to curb excesses and protect public health interests. In my view, it is this conflict of interest that is the number one obstacle to progress and we should be concentrating our efforts on tackling this problem if we really want to beat cancer sooner. But could the Government actually do anything to encourage more progress towards finding real cures if it was put under enough pressure? Well yes, I believe it could. For a start it could link patent periods to therapeutic benefit, awarding longer patents for new drugs that have lasting benefits for patients. It could increase public investment in drug research to provide real competition to the private pharmaceutical companies. It could start to measure how many cancer patients have actually been cured and develop targets to improve cure rates. And it could team up with other countries to create economies of scale in research (particularly within the EU), as cancer is cancer wherever it strikes. It is absolutely agonising watching someone you love die of cancer. And even more agonising knowing that your loved one may have died needlessly because we spent the last 50 years waiting for profit-motivated organisations to find cures that are not in their interest. We mustn’t stand by and just watch another 50 years pass by like this while fundamental conflicts of interest fuel profit from human suffering. Enough people have died, enough people have suffered and enough profits have already been made – we need to start putting patients before profits, for the sake everyone dying for a cure. If you’re not happy that the current system for developing life saving drugs for cancer patients is driven by a need to maximise profits rather than the need to maximise benefits for patients, please read more about the changes we want to see to put patients before profits.